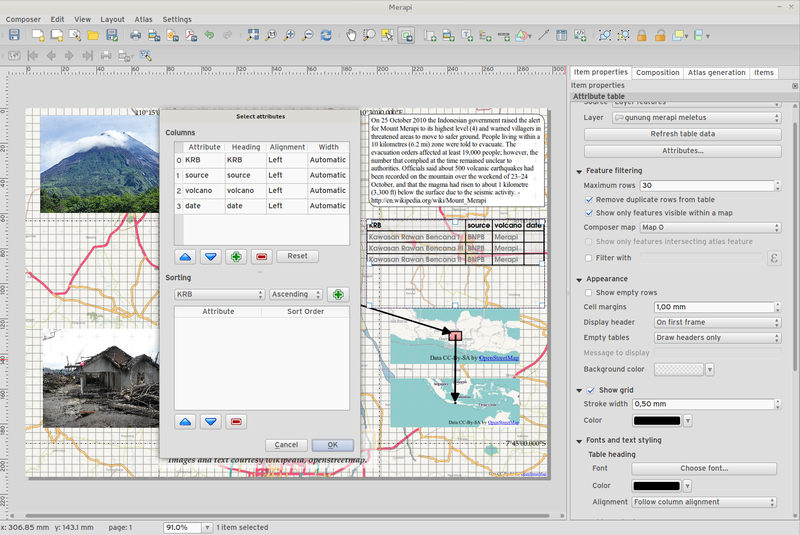 Change log for the next release of QGIS 2.6.0. 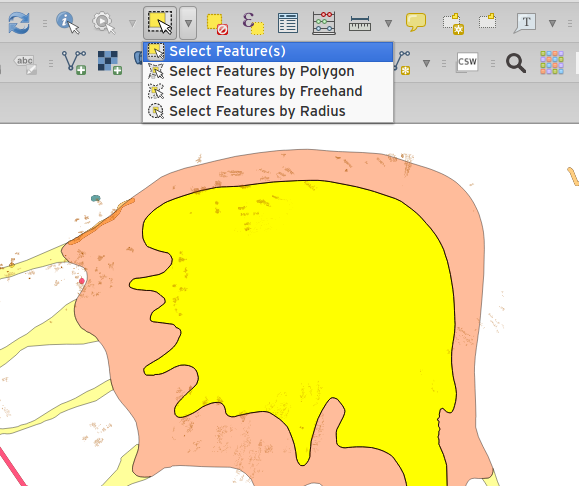 We have added many new features, tweaks and enhancements to make the most popular Free desktop GIS even more feature filled and useful. Whenever new features are added to software they introduce the possibility of new bugs - if you encounter any problems with this release, please file a ticket on the QGIS Bug Tracker. We would like to thank the developers, documenters, testers and all the many folks out there who volunteer their time and effort (or fund people to do so). 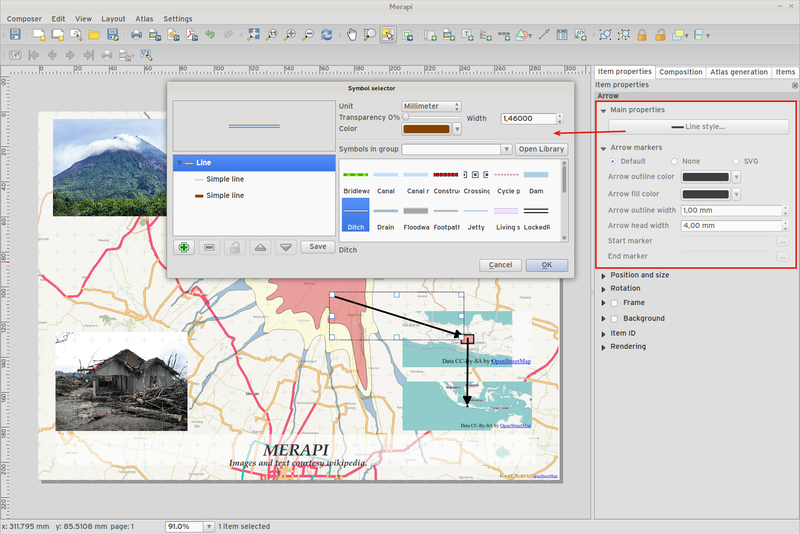 From the QGIS community we hope you enjoy this release! If you wish to donate time, money or otherwise get involved in making QGIS more awesome, please wander along to qgis.org and lend a hand! A current list of donors who have made financial contributions large and small to the project can be seen on our donors list. If you would like to become an official project sponsor, please visit our sponsorship page for details. Sponsoring QGIS helps us to fund our six monthly developer meetings, maintain project infrastructure and fund bug fixing efforts. 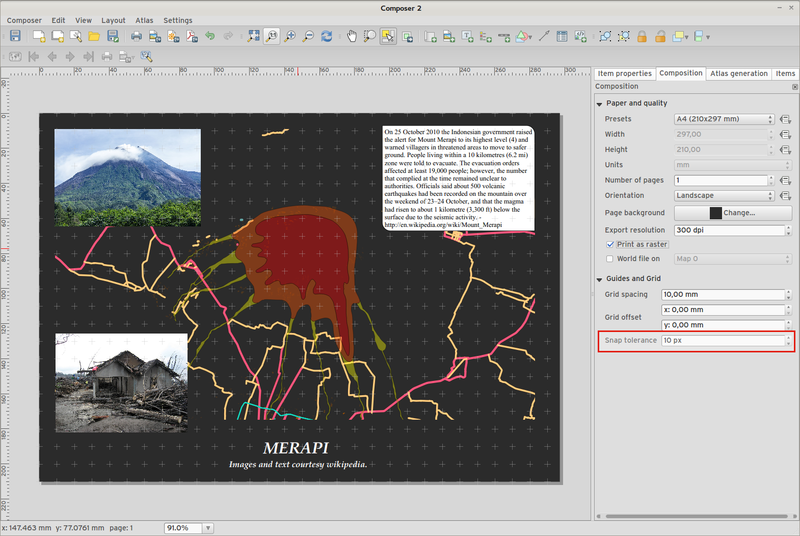 If you enjoy using QGIS, please consider making a donation to support the project - either financial or of your time and skills! Lastly we would like to also take a moment to encourage you to fund a special campaign by one of our QGIS developers to get a working test suite for QGIS so that we can improve out quality assurance process and deliver you the best possible releases. 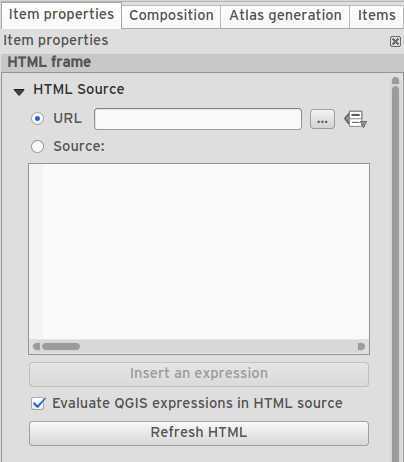 You can now see the full path for the QGIS project file in the project properties dialog. Now when you are measuring areas and distances, you can remove unwanted vertices from your measurement line using the delete or backspace keys. You can now use just a subset of related fields when creating a vector join. Sometimes you want to have an attribute that is calculated and that is always ‘fresh’ - reflecting the current state of the feature properties. 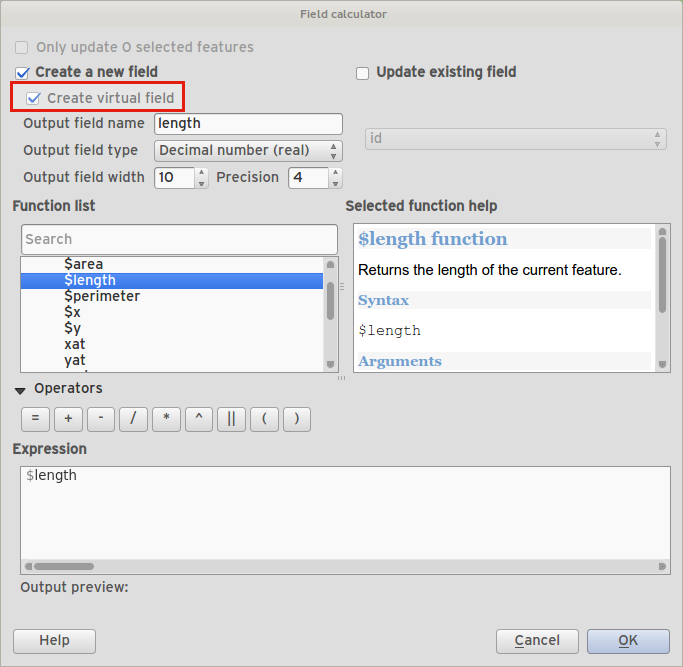 Now you can add virtual fields to your table which are based on an expression. When creating a custom action for a vector layer, you can now define an icon to be used for the action too. Allow using + for string concatenation. 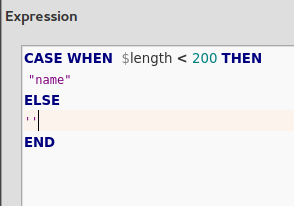 New keyword: attribute( feature, attribute_name ) - gets the specified attribute from a feature. New keyword: $currentfeature - returns the current feature. New keyword: $atlasfeature - returns the atlas feature. New keyword: getFeature - gets a matching feature from a layer. You can now choose to disable certain classes in graduated and categorised renderers without actually removing them. 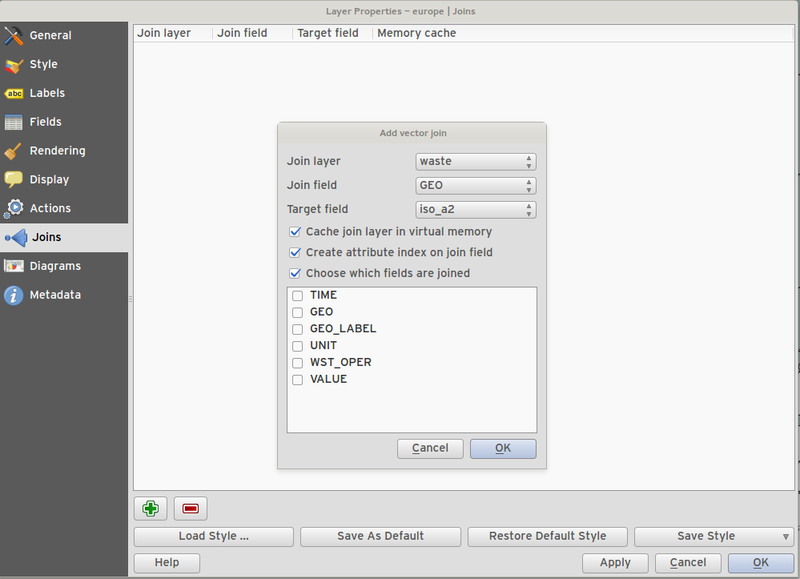 Visibility groups of map layers in layer tree. This new toolbar button allows quick changes between the groups of layers that should be visible. The new legend filter option on the legend toolbar will remove legend items for any classes which are not currently in the view extent. This is an awesome improvement as it ensures that your map legend does not contain entries for items not currently in the map view. 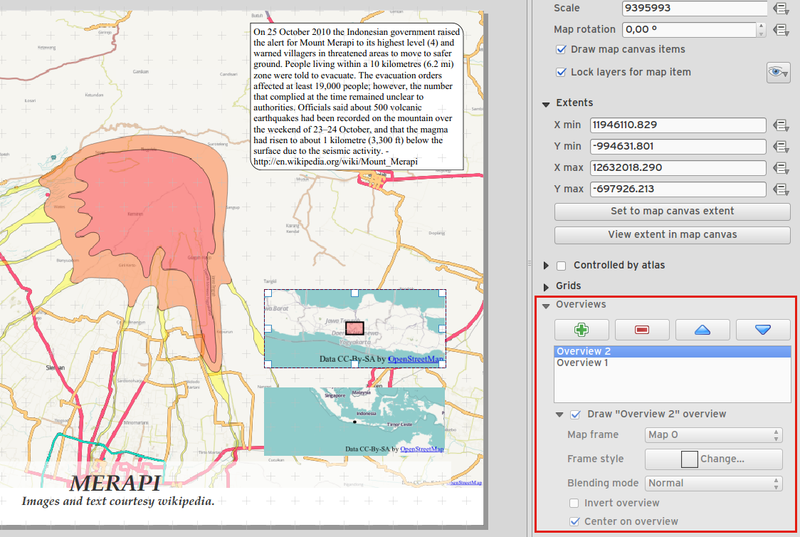 It is available in the main map legend and in map composer and for WMS layers. We have added a checkbox and data defined button for controlling whether an item is excluded from composer exports/printouts. If the item is unchecked it will be visible at composition design time only. For table or HTML frames, a checkbox now controls whether the containing page should be exported when the frame is empty. 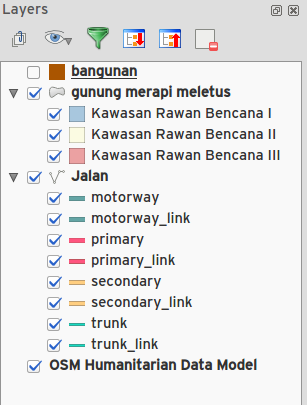 The item tree panel in the map composer allows for selection of items, hiding/showing items, toggling lock status of items and double-clicking to edit item id. You can also use drag and drop to reorder items. Map scale, extents and rotation. Page size, orientation and number of pages. 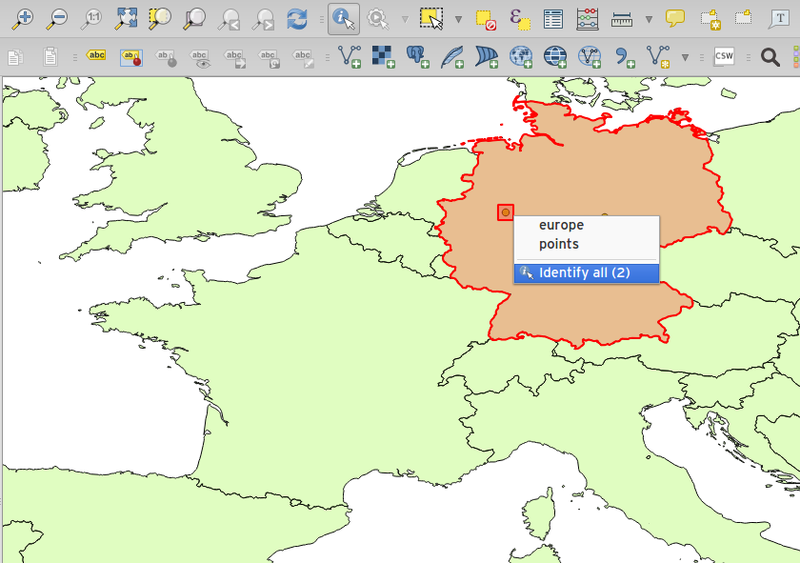 Picture items in the map composer now support remote urls as a picture source. This source can also be data defined. You can now set table header and content font colors. Tables can now be split across multiple frames, allowing their content to be distributed over columns or over different pages. Added option show headers on first frame, all frames, or no frames. Allow manual control of column widths. New options for table source, including current atlas feature and child features from a relation. Choice of behaviour for empty tables, include hiding the entire table, showing empty cells, or displaying a set message in the table body. Added a checkbox to filter table features to those which intersect the current atlas feature. Added checkbox to remove duplicate rows from table. Note that tables in existing projects are not automatically updated to the new table format which supports these features, and tables must be readded to a composition for the new settings to appear. 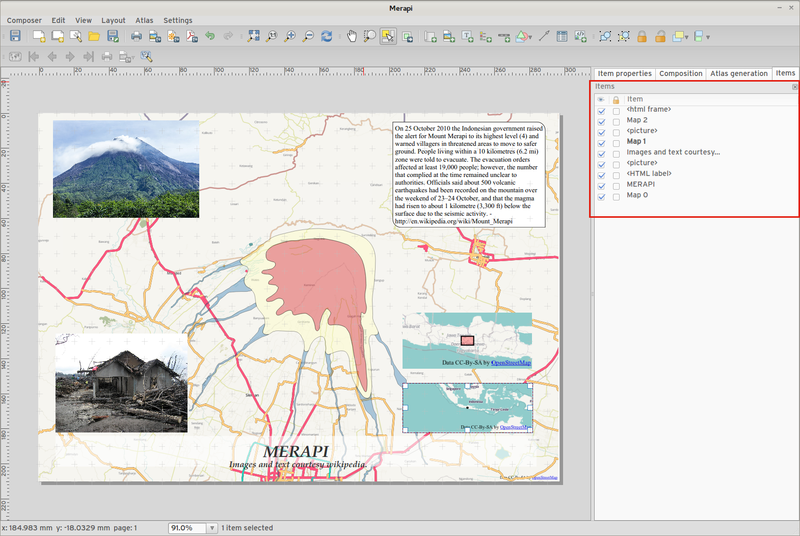 The map composer (used to prepare printable map compositions) has received a number of improvements in QGIS 2.6. Right click no longer locks/unlocks items, this is now handled by the new items panel. Locked items can no longer be selected from the composer canvas, allowing for interaction with items below them. Snapping thresholds are now set in pixels, allowing for finer movement and resizing of items when zoomed in to a composition. Items within a group are no longer used for auto snap lines. Sometimes it is useful to be able to show more than one overview frame for a map frame. For example if you want to show where your map is in local, regional and global context, using multiple overview maps can help you to achieve this. 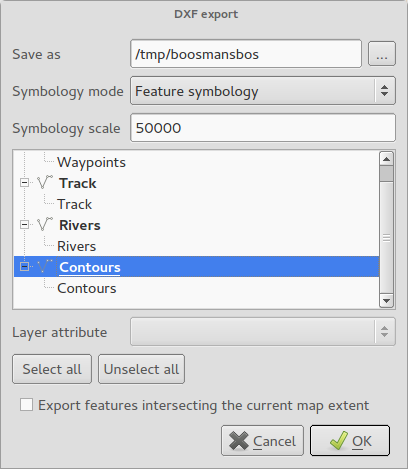 As of QGIS 2.6 you can now achieve this by assigning as many maps as you like to the ‘overview’ role in your composition. You can now have multiple grids with different properties. 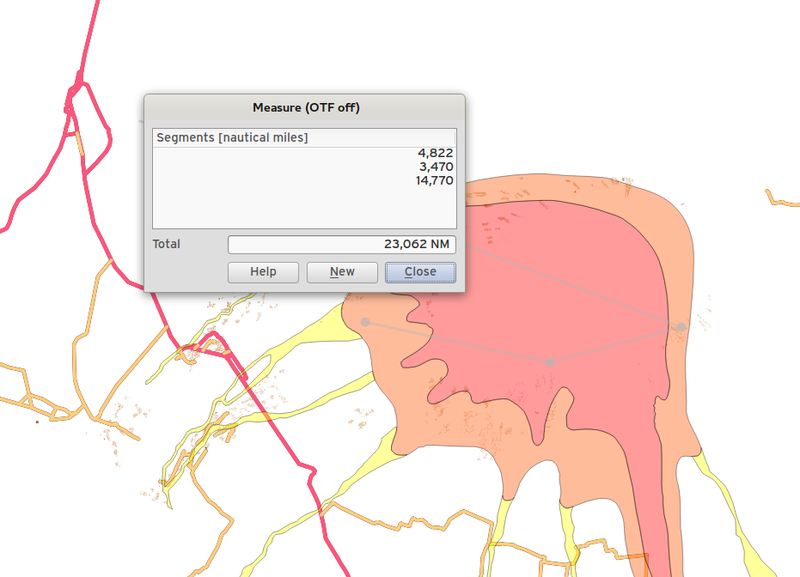 You can mix reprojected grids and Lat/Long grids. 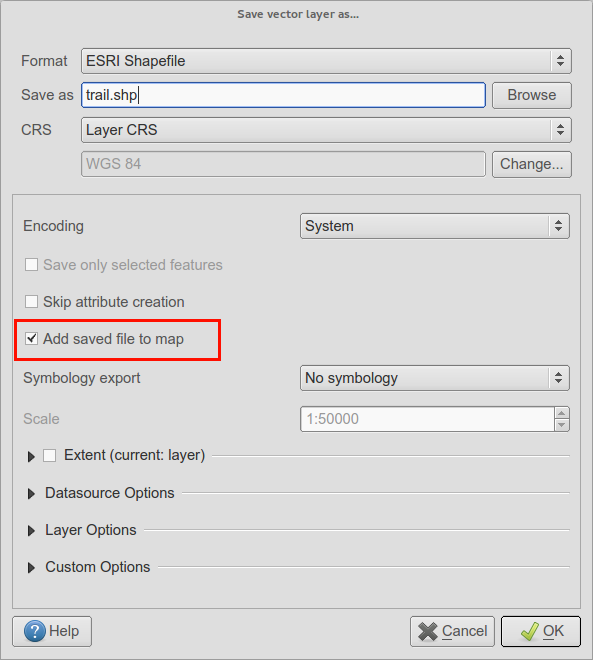 You can use standard QGIS symbology grid lines etc. There is a new frame/annotations only grid style. 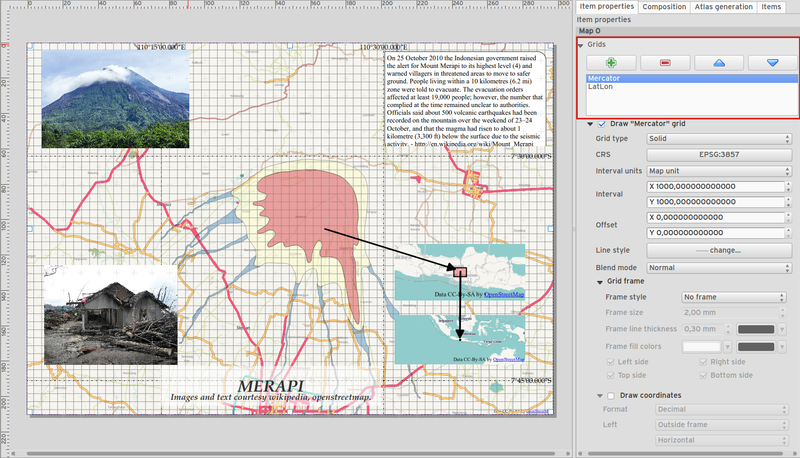 Selecting this style causes only the frame and annotations to be drawn, with no grid lines or other markings over the map. There are now options for controlling which side of a map item the frame is drawn on. There are new tick styles for frames, with inner ticks, outer ticks and both inner and outer tick options. We have made improvements to grid annotations, including many new formats for annotations. Grid annotations now use the typographically correct prime and double prime symbols for grid annotations. 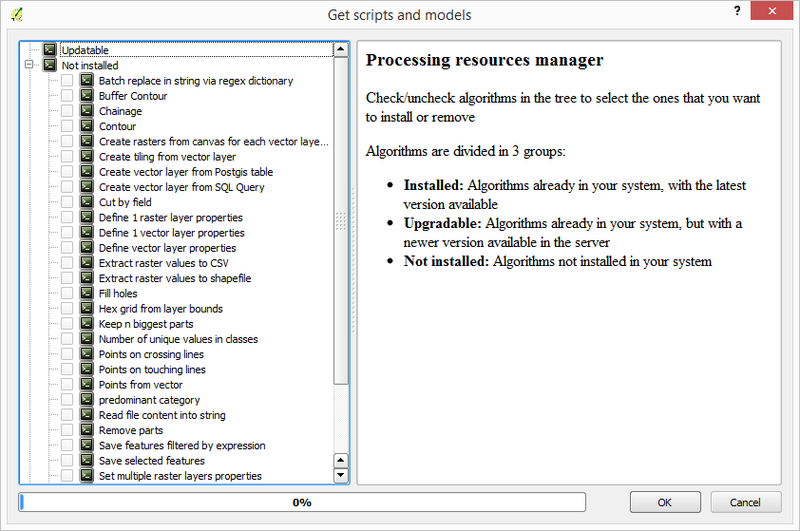 Models and scripts can be downloaded from the online collection and installed directly from the Processing interface. 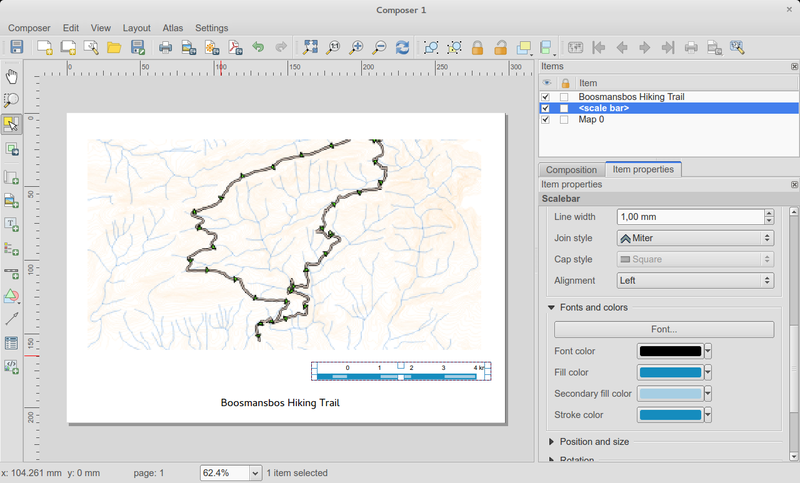 The collection will be expanded with new scripts and models provided by Processing users. The modeler has been rewritten, and now provides extra functionality such as allowing nested models with no depth limit. Models are now stored as JSON files. Backwards compatibility is kept, so all models can still be used. 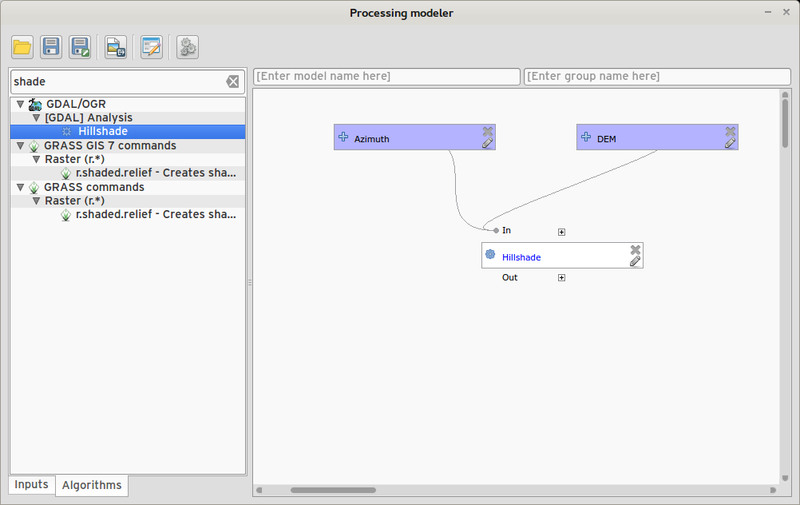 You can also now drag and drop items from the inputs and algorithms onto the modeler graph. We have improved the random colour algorithm for classified renderer so that the colours generated are more visually distinct from each other. 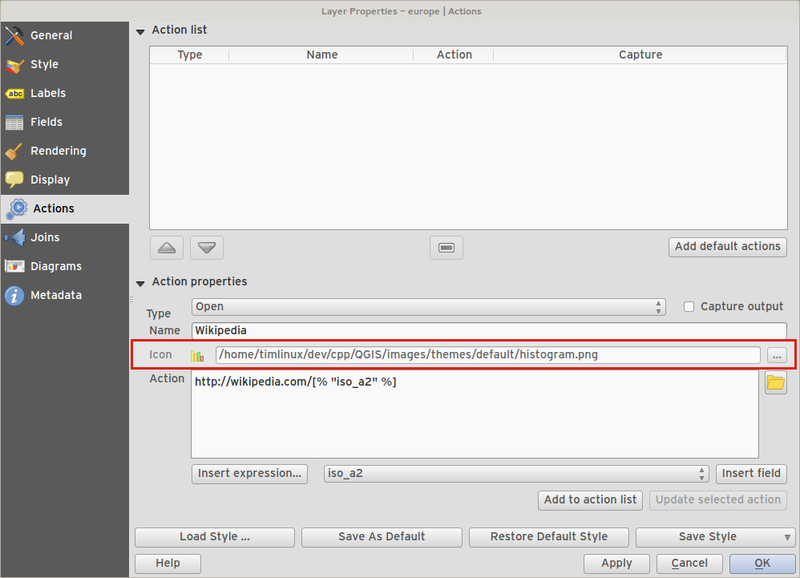 Where possible, properties of symbol layer are maintained when changing symbol layer type. Added an edit button for shapeburst and gradient color ramps. Automatic update of label and neighboring ranges boundaries. Classes are automatically converted from categorised and graduated classes when switching to rule based renderer. Added units and number of decimal places to graduated renderer labels. 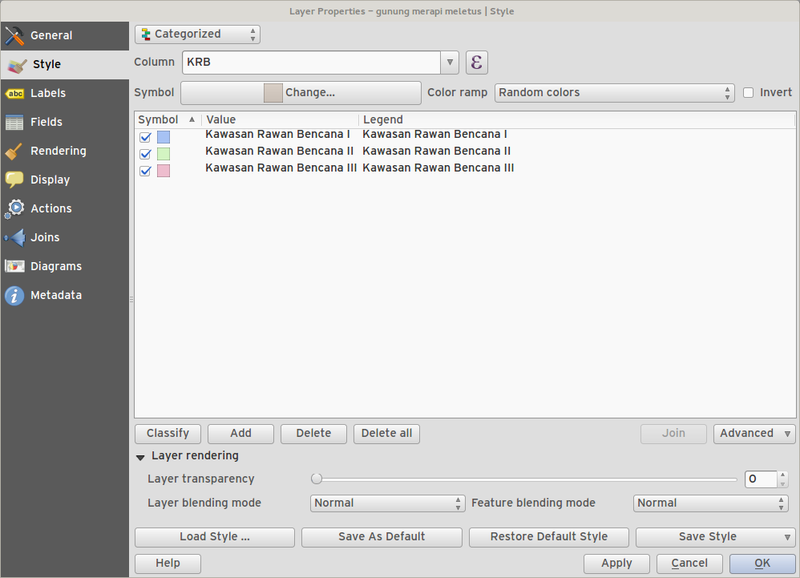 Improved responsiveness to changes in color ramp, inverted colour ramp, and other options in GUI. 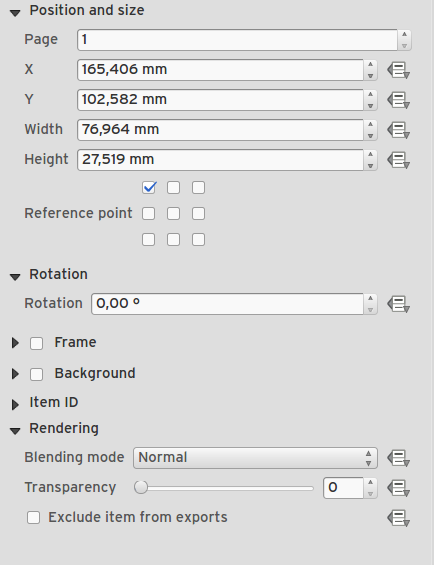 Retain symbol when switching between simple, graduated, categorized, and other renderers. Improved labelling of StdDev calculation mode. 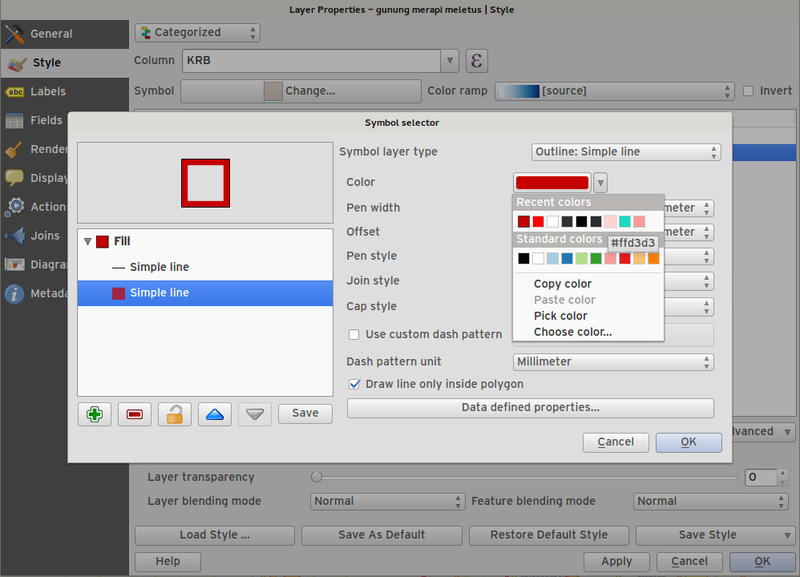 You can now define your own custom color palettes for use in QGIS. Custom user global color palette (in options dialog). 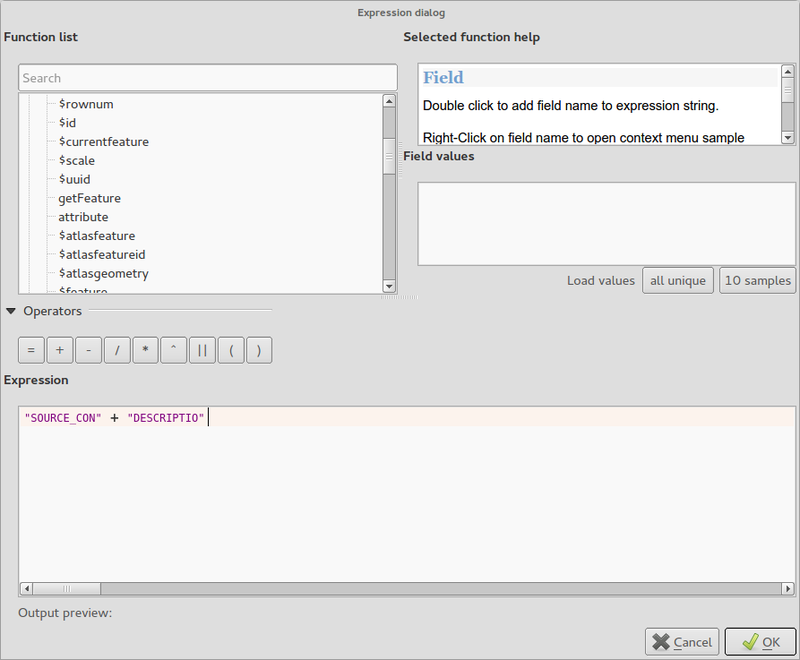 Per project color palette (in project properties dialog). 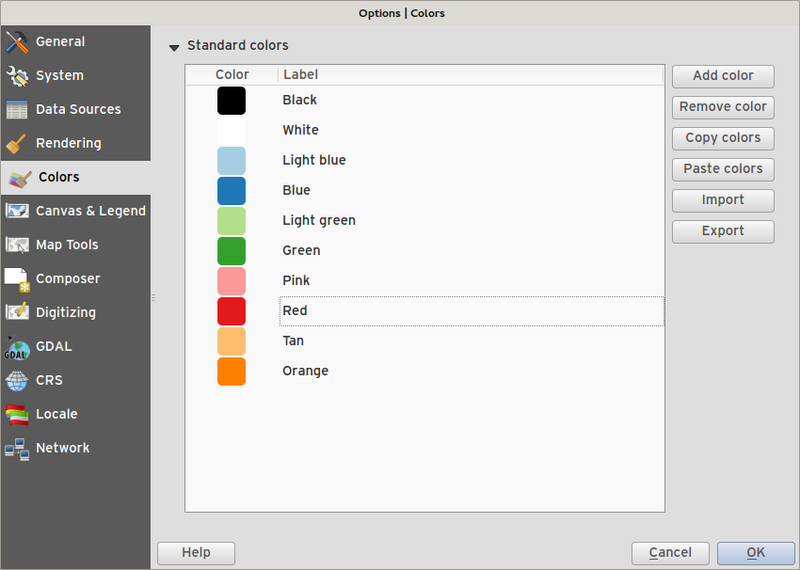 Colors are shown in color button menus and new color picker dialog. You can import/export colors to a GPL palette file. Sliders for hue, saturation, value, red, green, blue color components. Option to copy/paste html color codes (in a variety of formats). Before/after color preview, with alpha preview. Interactive 2D color ramp widget. 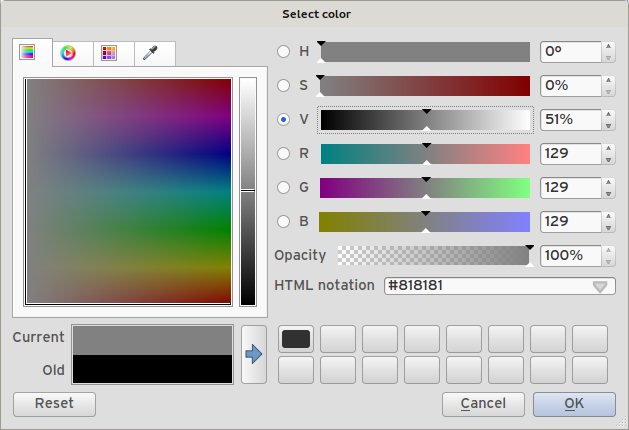 Editable color palettes, including the ability to create new palettes and import/export colors to a GPL palette file. 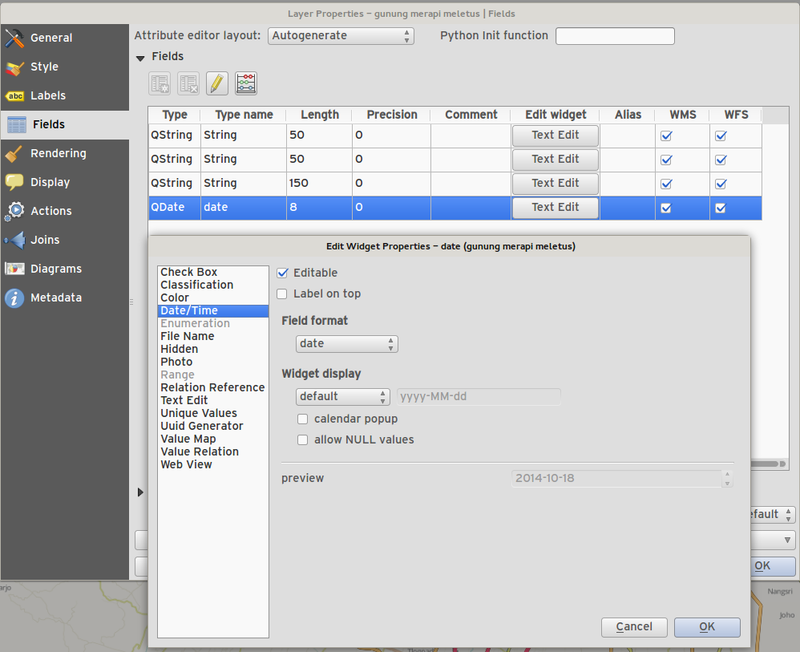 Live color sampler with option to sample over a set radius (OS support dependant). Supports interaction with other apps via drag and drop of colors (OS support dependant). Option to disable the dialog and use the native picker dialog instead. We have merged the single selection tool into the rectangle tool. If you want to select a single feature, simply enable the rectangle tool and then single click (rather than dragging a rectangle) a feature. 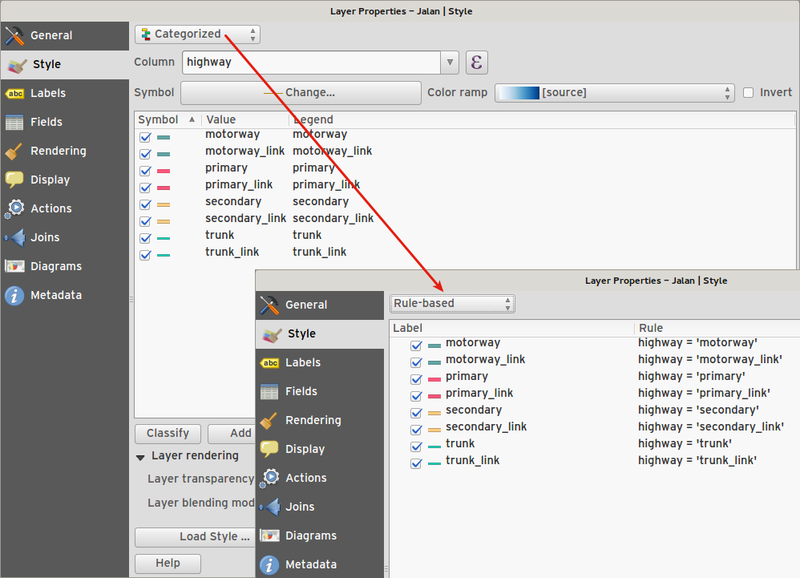 In many of QGIS’ dialogs that generate a new layer, the ‘Add layer to map canvas’ checkbox is now checked by default so that the new layer automatically gets added to the map. For those using QGIS on touch devices (or if you just like big, chunky icons), you can now set the icons up to 64 x 64 pixels in size. 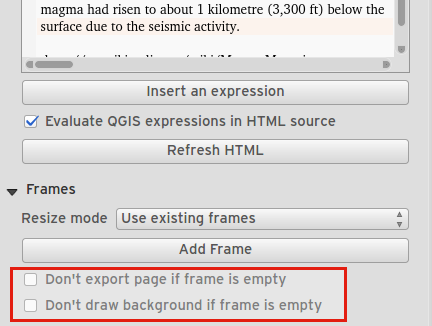 This is probably one of the most useful new features in QGIS 2.6 - especially if you are involved a lot in cartography work. 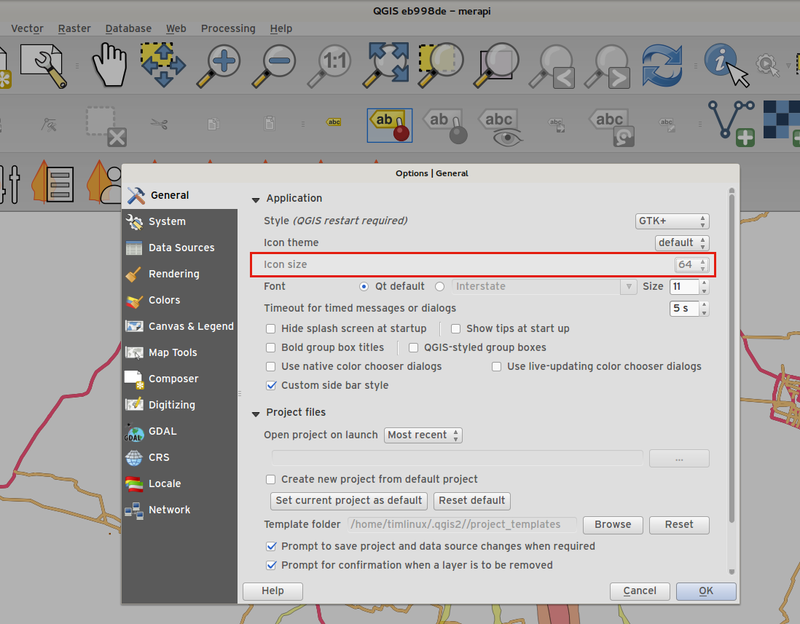 The colour button used everywhere in QGIS has been enhanced, with drop down menus, colour swatches, default colours, etc. Click on the drop down item to the right of the colour button to see the quick options. Click on the button to the left of the colour widget to see a standard colour chooser dialog. When using the identify tool, you can now right click on the canvas to use the identify tool in context mode. In the menu that appears you can define which feature types you wish to identify (all all if you like).